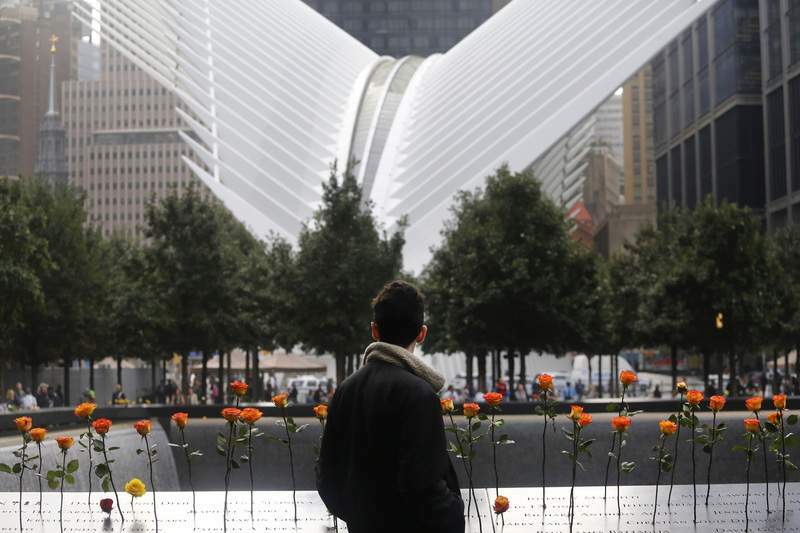 Associated Press photos A visitor stands at the World Trade Center memorial plaza in New York during a ceremony Tuesday on the anniversary of the 9/11 terrorist attacks. 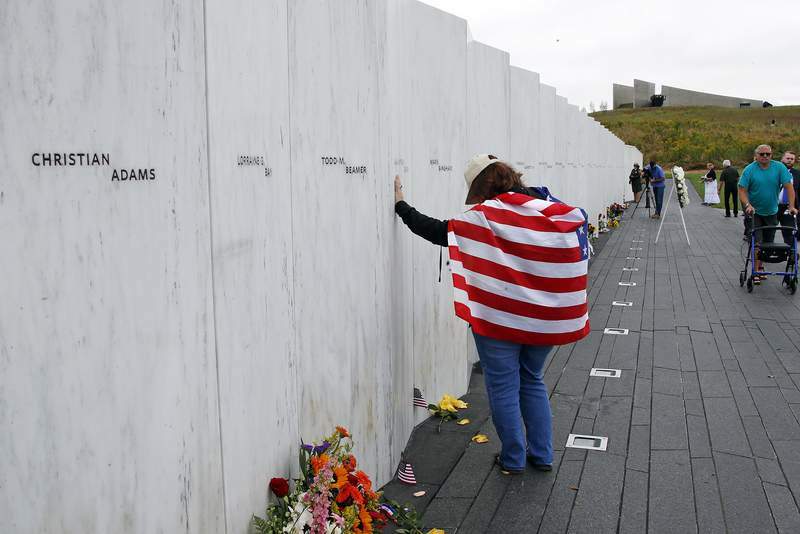 Chrissy Bortz of Latrobe, Pa., pays her respects at the Wall of Names at the Flight 93 National Memorial in Shanksville, Pa., after a memorial service Tuesday. “To me, he is here. This is my holy place,” she said before the hours-long reading of the names of her husband, Joel Miller, and the nearly 3,000 others killed when hijacked jets slammed into the towers, the Pentagon and a field near Shanksville, Pennsylvania, on Sept. 11, 2001. Calling it “the moment when America fought back,” Trump said the fallen “took control of their destiny and changed the course of history.” They “joined the immortal ranks of American heroes,” he said. The 9/11 commemorations are by now familiar rituals, centered on reading the names of the dead. But each year at ground zero, victims' relatives infuse the ceremony with personal messages of remembrance, inspiration and concern. For Nicholas Haros Jr., that concern is officials who make comparisons to 9/11 or invoke it for political purposes. This year's anniversary comes as a heated midterm election cycle kicks into high gear. But there have long been some efforts to separate the solemn anniversary from political campaigns. The group 9/11 Day, which promotes volunteering on the anniversary, asks candidates not to campaign or run political ads for the day. Organizers of the ground zero ceremony allow politicians to attend, but they've been barred since 2011 from reading names or delivering remarks. “My hope is that discrimination, hatred and bigotry will cease and that we all will come together and love,” said Debra Epps, a sister of victim Christopher Epps. Another sister, Chaundera, had an answer for anyone who wonders why families still come to such ceremonies after 17 years.